Quickly create a 3D Zone Indicator volume using Volume Maths. This type of volume is handy for quickly identifying pinch-outs, inconsistencies in horizons, formation extents, etc. In the following simple example we use two horizons to define the zones. Follow the workflow below to create your zone indicator volume. Add your two input horizons. By default, this process creates a volume with the class set to “unknown”. To get a great looking display, we’ll need to update the class. In the Class tab of the Control Panel, Create a new class. Name the class “Zone Indicator”. Load a nice colourbar (hint: banded colourbars work really well for indicator volumes). 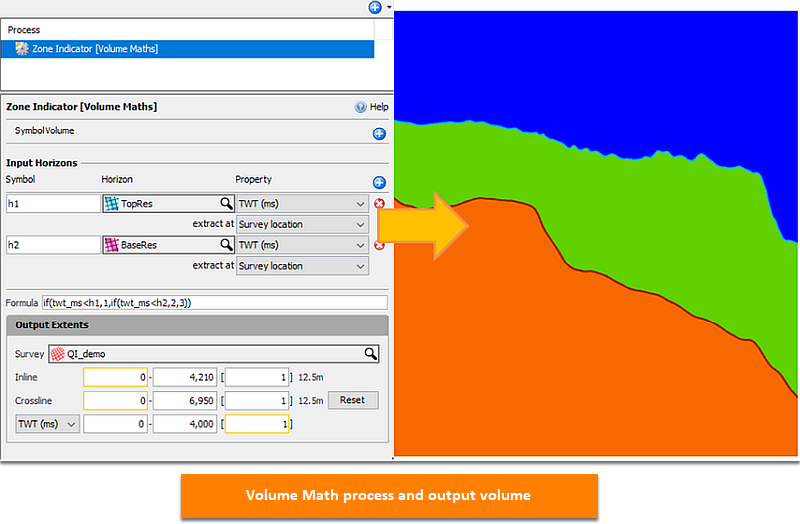 Set the min and max values to the first and last output values from the volume math, i.e. 1 and 3. Finally, in the Volume tab of the Control Panel, choose the “Zone Highlights” result volume, and set the class to “Zone Indicator”. You can incorporate more horizons and layers by adding more nested “if” statements or by linking multiple Volume Maths processes. The simple volume generated by this process can be displayed on its own. 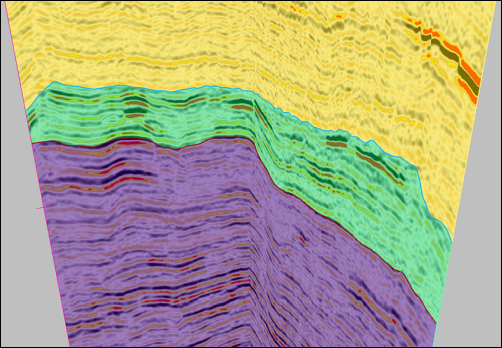 For our example display, we’ve created a group with the Zone Highlights above the seismic volume.